1.Pressure cook Chickpea with salt.Keep aside. 2.Add oil in a pan and pop mustard.Then add ginger-garlic paste and fry till raw smell is gone. 3.Now add onion, bell pepper and carrot. Fry them well and when the onion turns golden brown, add little qty of salt, red chilli powder and garam masala.Mix well. 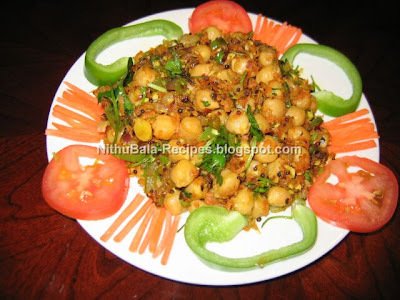 4.Now, in medium flame add cooked chickpeas and mix the contents well. 5.Close the pan with lid and leave it as such for another 5 minutes. 6.Before taking out of the stove, add chopped coriander and curry leaf. This participates in The Crispy Cook's MLLA - 20, an event started by Susan. Another creatively decorated and tempting dish. Thanks for sending it over to My Legume Love Affair. wow really good post... and pic looks awesome..
this is simple and tasty! Nice click too! Nice entry for the event! I love spicier,but i knew only a mild version,thanks for the recipe!